Smith revealed that both Urban Meyer and Gene Smith knew of the police looking into 2015 accusations against him. When Ohio State wide receivers coach Zach Smith was fired in the wake of a May criminal trespass charge and a following domestic violence civil order filed against him by his ex-wife Courtney, his lawyer said Smith wasn’t going to talk outside of court. Well, a lot’s happened since then, with Ohio State head coach Urban Meyer initially denying he knew of the 2015 domestic violence accusations against Smith, Brett McMurphy’s story (supported by texts, photos and comments from Courtney Smith) casting doubt on that, Meyer being placed on paid leave while Ohio State investigated, and Meyer coming out with a statement Friday saying that he did know of the 2015 accusations and “followed the proper reporting protocols,” taking those accusations to Ohio State athletic director Gene Smith. 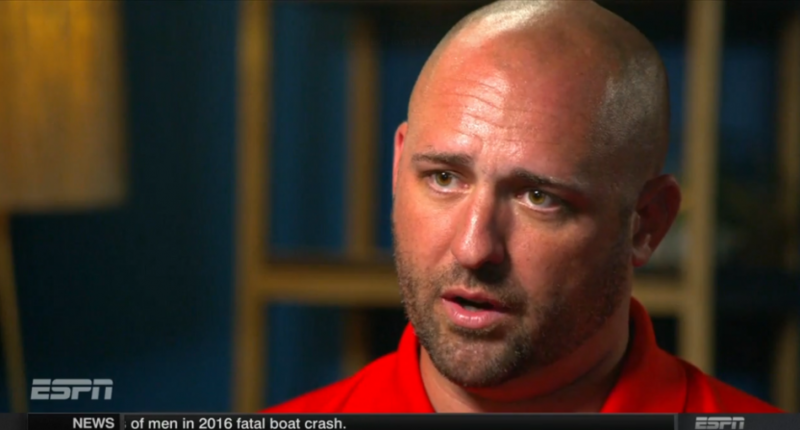 Some of these Zach Smith quotes: "I've made mistakes … I was still in love with her … I don't believe I ever threatened her … No one did anything illegal, this should have stayed behind closed doors because now my kids have to deal with it." Why did Urban trust this guy? Zach Smith on 105.7 in Columbus right now. Says he's never committed domestic abuse. "I never hit her, I never got arrested, I never got charged. I never did anything to physically harm her." Zach Smith on 105.7 in Columbus: “I’ve never committed domestic abuse against her.” Says he had to “defensively restrain her” at times. While denying he hit his wife, Smith makes it clear he was responsible for her injuries. He claims that was either to get away from her or in self-defense. Smith makes it clear that both Urban Meyer and Gene Smith were informed of the allegations against him in 2015 and of the police involvement. Smith also told ESPN that this should have stayed between him and his wife, and his bosses shouldn’t have investigated further. Smith told ESPN it would be “a crime” if Meyer lost his job over this. Both ESPN and The Zone are taking criticism for giving Smith this kind of platform. There’s undoubtedly going to be much, much more fallout in the days and weeks ahead, and we’ll see what this winds up meaning for everyone involved.